Bee and Wasp Removal in Florida is a common and dangerous issue that needs to be addressed quickly and by a professional. Guaranteed bee and wasp removal services starting at $150.00. Call us now at 407-733-8623. There are many different species of bees in Florida that all fall into 3 simple categories: Carpenter Bees (genus Xylocopa), Bumble Bees (genus Bombus) and Honey Bees (genus Apis). Carpenter Bees, though often found living near one another, are solitary bees that tunnel into wood to build their nests. These nests will often have multiple openings throughout a complicated tunnel system where carpenter bees will store pollen and larvae. The openings to the nest look like perfect circles, a little more than a half an inch wide, drilled into wood. This typically becomes a problem when they build their nests in wood siding, fascia and soffit. Bumble Bees are prolific pollinators, but not common in Florida. They’re regularly found in higher latitudes and higher altitudes, but some species can be found in Florida’s more tropic climate. Bumble bees are a social bee, living in nests with one queen that don’t usually number over 50. They will normally nest in large hollow plants or under the ground and do not create honey or honeycomb the way honeybees do. Honey Bees are the most common bee problem we have in Florida. Bees will move into trees, holes in walls, soffit, pretty much anywhere they can fit and build a honeycomb. 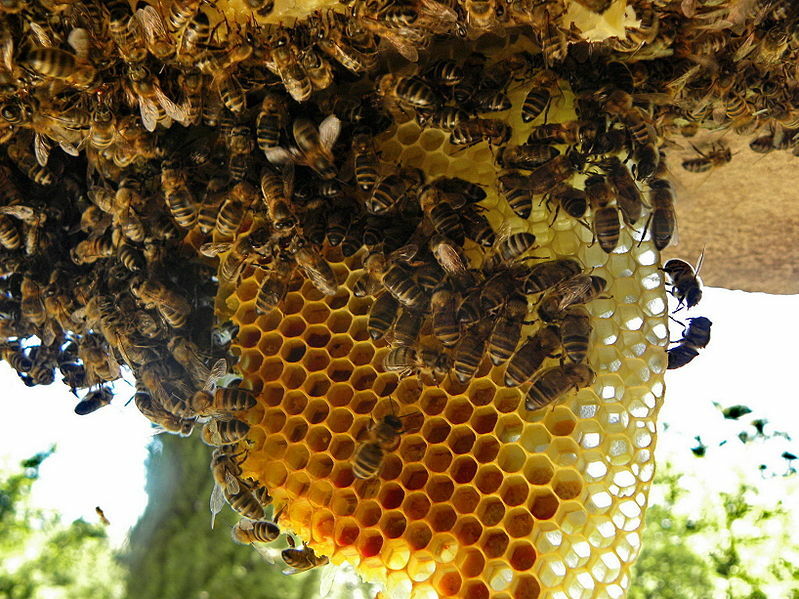 Honey bees are a very important part to the earth’s ecosystem and are dwindling in number. Because of the steep decline in their population, it is important to remove bee hives in tact whenever possible and only exterminate if no other method of removal is possible. Honey bee hives are typically very large and a swarm of bees can reach 6,000-8,000 before even starting to build a hive. Along with the bee population of Florida, there are 4 categories of wasps found here as well: Yellowjackets (genus vespula), Hornets (genus vespa), Paper Wasps (genus polistes) and Mud Wasps (genus sceliphron). 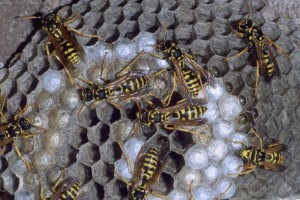 Yellowjackets are small, aggressive, ground-dwelling wasps that nest in great number (up to 5,000 per nest). They are most active in Spring and Summer and will violently defend their nests, stinging over and over again without losing their stingers and dying. Yellowjackets grow to about a half-inch in length, and resemble honey bees in size and markings, although yellow jackets are a brighter yellow. Hornets are essentially a larger version of the yellowjacket. Apart from growing up to 2 inches in length, they have similar markings and coloration to the yellowjacket and build similar nests. Hornet nests usually range in size from as small as a football to as large as a basketball and can be found in the ground, on the side of buildings, in trees, walls or attics. Paper Wasps are the medium-sized red-or-brownish colored wasps that make their nests around the eaves and in the attics of our homes and buildings. These nests are a grey honeycomb-shaped wad of paper-like material that start small but can grow to a few inches wide in diameter over time and can hold from anywhere from 4 to 30 wasps. Mud Wasps are unique compared to other wasps in Florida for a number of reasons. They are solitary, non-aggressive wasps that create clay-like nests from mud that they collect throughout their lives. They feed mostly on spiders and nest up around eaves, porches and inside attics. The good news is: regardless of which critters may be causing you distress, Florida Wildlife Busters is capable of quickly determining your problem and effectively solving it for good. Bee and wasp removal isn’t easy for anyone, but we provide a guaranteed solution to whatever bee or wasp issue you may be dealing with.